"Dad! Be a zombie! Be a zombie, Dad!" So was the shrill and joyous cry of several young children as they coached a parent through a game of zombie-themed chase-and-scream on a recent afternoon at Corte Madera Town Park . Dutifully zombified, the father ambled and shuffled toward whichever of the children was screaming and giggling the loudest, as the pack of them went running onto, under or over a variety of structures designed for just such a game. "Aaaarghhhh! " said Zombie Dad. "Aaaarghhhh! I'm going to eat your braaaaaains, " adding, "Danny, don't go too high on the climbing wall!" One of the playground's notable features is the racetrack, a miniature two-lane road that runs around the edge of the play yard, replete with railroad crossing signs, traffic signal and yellow stripes. On such a road, kids can bring their pedal cars, Big Wheels and scooters, and race each other like Lightning McQueen and the Fabulous Hudson Hornet. The road makes a complete loop around a tiny wonderland of kid-friendly attractions, from the usual tire swings and tunnel slides and bouncy bridges and monkey bars to such newfangled inventions as a vertical xylophone, rubberized play floors with enormous round dots in bright colors and, of course, that climbing wall. "This is a great playground," proclaims a twenty-something man with a Giants cap and a bundled-up child whose name is apparently "Boo Boo." 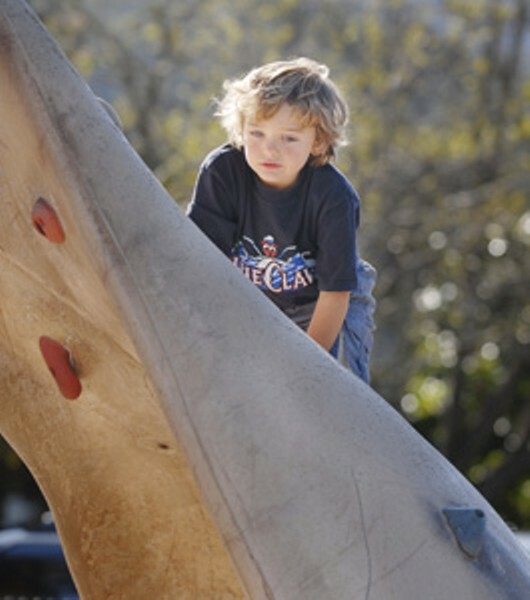 "We live in San Rafael, but we come all the way to Corte Madera for this park. Boo Boo likes the wooden motorcycles. "Said motorcycles, located not far from the race track, are an evolutionary improvement over those old-fashioned metal animals on springs that many of us older folks grew up with. Also on springs, the motorcycles are brightly painted and clearly irresistible to small children and parents who nickname their kids after cartoon characters. For some older parents, the coolest part might be the way the park mixes the new with the old. Here and there are iconic elements from playgrounds of the past: a large stone turtle with a quizzically blank face, the plastic lion drinking fountain, a cement dolphin designed for sliding back and forth on. That turtle, especially, still maintains an immense power to charm, though when being chased by a brain-eating parent, one might want to hide elsewhere. That turtle, evidently, cannot stop the inexorable pursuit of Zombie Dad, or the laughs and tickles that will ensue when he finally finds you. Corte Madera Town park is at the corner of Pixley and Redwood avenues, Corte Madera. —D.T. Gold, aquas and magentas meld majestically in a dreamland of castles, frogs, princesses, moon-jumping cows, fiddle-playing cats and doomed eggs balanced precariously on stone walls. No, this is not a recall of college nights spent on your dorm room floor in a hallucinogenic coma. Decidedly more wholesome, a domed mural titled Celebrate the Joy of Reading has graced the ceiling of the children's section of the Rohnert Park-Cotati Library since 2003. Brilliantly hand-painted by local architectural illustrator Robert Eisenberg, the mural is the perfect umbrella for children and parents as they gather for weekly story times. "It was such a cool thing to be able to do," Eisenberg says. "Libraries are wonderful, and it's great when communities put money towards improving them." Eisenberg's Los Angeles high school library had a large mural depicting a golden sun over the countryside, complete with a hidden four-leaf clover that only the luckiest were able to find. The sun mural inspired in him respect for the art, and he was thrilled to be able to bring his mural appreciation to Sonoma County. Using the 500-year-old traditional method employed by Michelangelo in the Sistine Chapel, Eisenberg copied small-scale models onto large pieces of paper, made tiny holes along the lines of the drawings, then tapped along the little holes with bags of charcoal dust. Voila! An old-school version of "overhead projection" is born. Eisenberg then expertly painted over with acrylic paint, the mural painter's first choice. Deciding on which images to incorporate was easy and largely based on stories Eisenberg loved as a child. "Growing up, literature was always important to me," he says. "Once I started reading, the whole world was opened up." Rohnert Park-Cotati Library, 6250 Lynne Conde Way, Rohnert Park. Wiggle Time (ages one to two), Tuesdays at 10:30am; preschool story time, (ages three to five), Wednesdays at 10:30am. 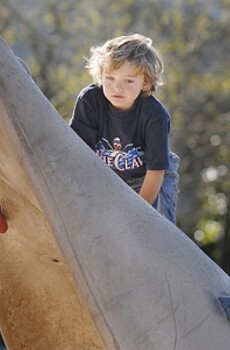 Other story times and events vary by month, check www.sonomalibrary.org for details. 707.584.9121.—B.H. A physical body will remain at rest, or continue to move at a constant velocity, unless an unbalanced net force acts upon it. Surrounded by 40 acres of apple trees, what better spot to study Newton's Laws than at Sebastopol's Twin Hills Apple Ranch. Imagine Sir Isaac sitting under a tree, hit on the noggin by a stray Gravenstein. A light goes on over his bruised head, and he conceives the laws of motion. The net force on a body is equal to its mass multiplied by its acceleration. Say a group of kids take a long, heart-pumping bike ride on the back roads outside town, ending up at the same ranch as Newton. Inside the funky wooden barn, they sell all forms of healthy products including fresh, dried, juiced, jellied and preserved apples; they bake them into pies, cookies and breads—everything a child could desire for a nutritious midday snack. But the 67-year-old ranch also sells illicit treats priced like 1967, and the kids' choice is a tough one: red or black 5 cent licorice, 10 cent fireballs or a 25 cent lollipop? Or maybe they'll really splurge and spend a whole dollar on the big chocolate bars or sour candy necklaces, the cheapest candy in town, stuffed down before their parents know what they're up to. For every action there is an equal and opposite reaction . . . Twin Hills Apple Ranch, 1689 Pleasant Hill Road, Sebastopol. 707.823.2815.—S.D. The cute young musician throws back his hair, caresses the mic and screams 'I'm on a highway to Hell!" while guitars screech and wail behind him. Sorry, boomers, AC/DC isn't rehearsing for an upcoming reunion tour in this funky wooden warehouse; it's just kids practicing at The Great Burro Studios. Now in its fifth year, the studio run by Spencer Burrows and his wife Norah offers rock band and funk horn camps to students from 11 to 16, with the goal being to get a band up and running and performing publicly onstage. Burrows says, 'The parents these days are from the generation that grew up with classic rock, maybe who don't play music themselves, but see that there's potential in their kids to play music that they like, rather than take the classical approach." The spacious studio sports multi-hued green and blue walls, a vivid red circular rug, and the 'wall of fame," a collage of photographs of band participants in action. Although all the usual instruments are available for play in the studio, including seven different brightly colored electric guitars, almost all students provide their own so they can drive their parents crazy practicing at home. When asked if he ever gets tired of hearing the same riff played repeatedly, Burrows laughs. 'There are songs that I can't stand when I hear them on the radio, but when the kids play them, it makes the song a lot more palatable." The week-long camps start off with the future rock stars choosing a repertoire and learning on-the-job what it takes to be a band, including the fun of choosing a name like Chainsaw Embrace or Walrus Hunt. After days of intense rehearsals, bands play for the public at such local venues as the Last Day Saloon, Chops and area festivals. From there, 'some bands have gone on to take the reins of their own group," Burrows says. 'It's good for kids who have a lot of extra energy and play instruments to harness that energy and become a band. There are only two rules here. Number one: Respect. That's a blanket for everything. And number two—have fun!" The Great Burro Studios, 3598 Gravenstein Hwy. S, Ste. B, Sebastopol. 707.829.5668Private lessons also offered.—S.D.